Unless they can upgrade the defense and find a capable successor to Eli Manning, Big Blue's future will be dim. 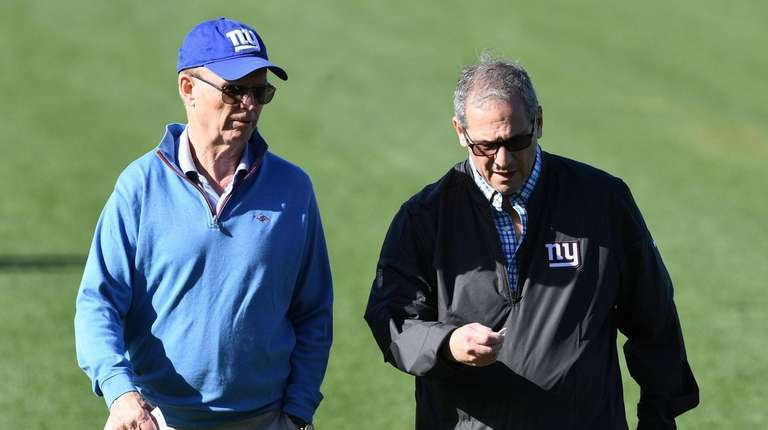 PHOENIX – To hear Dave Gettleman and now John Mara tell it, the Giants’ seemingly dire situation doesn’t seem all that complicated to fix. Gettleman last week explained the recent blockbuster trade of Odell Beckham as a difficult yet necessary step to take in the over building – remember, don’t call this a “rebuilding” team – of a competitive roster in the years ahead. And Mara on Sunday laid out what he believes is a cogent and perfectly plausible plan of what’s in front of a team that went 8-24 the past two seasons. Mara continues to believe that Gettleman and coach Pat Shurmur are the right people to execute the plan, and that good things eventually will happen to a franchise that has been to the playoffs just once since that memorable Super Bowl run after the 2011 season. But it is certainly fair to raise questions about whether the plan will work, especially after the team decided to dispense with Beckham just a year after signing him to a $90 million contract extension, a record at the time for a wide receiver. The Giants got a first-round pick, a third-rounder and former first-round safety Jabrill Peppers out of the deal, giving them a dozen picks in next month’s draft. But no one should be under any illusions about an immediate turnaround from a 5-11 season that followed a 3-13 nightmare. The Giants have a terrific running back in Saquon Barkley, a solid slot receiver in the recently signed Golden Tate and an improving offensive line. But with Eli Manning 38 and in need of plenty of help around him to be successful, this is far from a competitive roster. Throw in the fact that the defense is still well below par, and it will be hard to find anyone who believes the Giants will finish anywhere other than third or fourth in the NFC East. But Mara believes the future is bright, especially if the Giants find a quarterback to begin grooming under Manning. The Chiefs used that arrangement to springboard Patrick Mahomes, a first-round pick who learned behind Alex Smith in 2017 before bursting into prominence as last year’s NFL Most Valuable Player. But there may not be another Mahomes in this draft – or many other drafts, for that matter. Nor is there another Manning, so the Giants will have to hope they can find a serviceable quarterback to carry them into the future. There are few remnants remaining of former GM Jerry Reese’s drafts, and this is clearly Gettleman’s roster that will determine the future. If he gets it right on enough picks – and especially if he finds the right quarterback – then there is genuine reason for optimism. If not, then the misery will continue, with no foreseeable end in sight.